Gakkens gramophone kit will allow people to record their own records. The great thing about Gakkens gramophone kit is that it can play records of any size. The record player is also powered by a crank instead of consuming electrical energy. The gramophone is one of the only devices on the market that allows users the ability to record their own music directly onto a vinyl record. Recording a record is fairly easy. First, a person needs to find a good song. Second, they need to simply sing into the horn. As they sing into the horn the bamboo needle cuts grooves into the new vinyl record. This may be a fun device for DJ’s and is also ideal for those that own a vinyl record collection or people that are simply music lovers. The machine itself looks very vintage and is a perfect replica of many of the gramophones that were used in the early 20th century. There are some concerns about the quality of the music that would be recorded with the kit. Fortunately, the kit does allow for tone and speed adjustment. The Gakken gramophone kit comes with the gramophone body, a bamboo needle, a recording sheet, and a bamboo needle cutter. 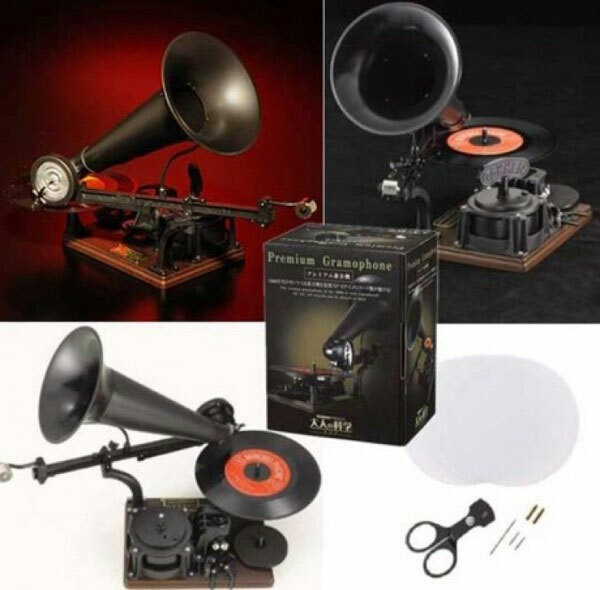 Individuals can expect to pay about $170 for the gramophone.